Next month SIFF Cinema will feature one of the rarest screenings of the past 40 years, including a marathon presentation on January 13th! 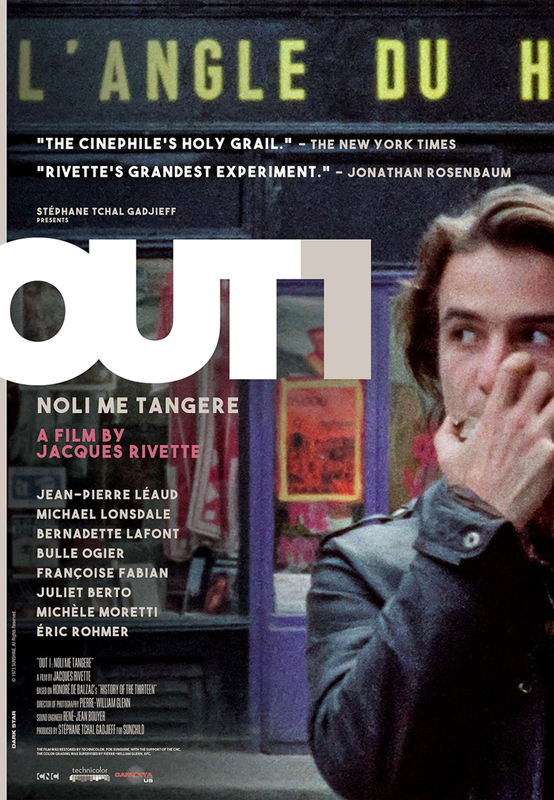 Those who live in New York were privileged to the premier of this new restoration of "Jacques Rivette’s 1971 Film, ‘Out 1: Noli Me Tangere’" as part of BAMcinématek's two-week engagement this past November. The Guardian's review, "Out 1: Noli Me Tangere: 13-Hour Art Film is a 'Buff's Ultimate Challenge" not only noting the film's scarcity, but the challenges of it's duration and narrative experimentation. This nearly 13-hour work has stood for decades as a kind of filmic holy grail. A cinematic soak both sprawling and intimate, which has been almost impossible to view in the more than 40 years since its ill-fated release in 1971. In testing the porousness of the border between narrative and experimental film, and sporadically injecting the work with galvanic shocks along the way, Rivette’s monstrous cinema experiment delivers an experience that is satisfying in-part for precisely the reason it is thoroughly exhausting. This duration-oriented film experiment by an artist without whom there'd likely be no David Lynch or Charlie Kaufman, the operator in the shadows of the French New Wave, Jacques Rivette. Best known in English speaking cultural spheres for his dreamy, non-sequitur, political, feminist, "Celine and Julie Go Boating" along with "Le Pont du Nord" of a decade later, which has seen a lot of press in the subsequent year since the rerelease of a new restored print in theaters, like that of Max Nelson's "Rep Diary: Le Pont du Nord" for Film Comment. The parallels between Rivette and Lynch's work made explicit in Dennis Lim's "A Winding Trip Reverberates in Cinema" and the rediscovery off his film seen as a path forward for all of contemporary cinema in David Thomson's "Come and See" in the pages of Sight & Sound. For many cineastes though, certainly fans of the New Wave, Rivette's "OUT 1: Noli Me Tangere" has always been THE holy grail. A nearly thirteen hour loose adaptation of Honoré de Balzac’s "L'Histoire des Treize" from his "La Comédie Humaine", one like "Celine and Julie Go Boating" and "Le Pont du Nord", the film centers on Rivette's central obsessions; conspiracy, community, theater, games, multiple personifications, illusion and madness. The extended duration, oblique themes and non-linear dreamlike construction no doubt working against it's larger release, even in the more conducive cultural/cinema environs of the early 1970's. So much so that "OUT 1: Noli me Tangere" has been screened in it's totality on so few occasions, that they previously could be counted on two hands. When French television turned down the complete thirteen hour version, Rivette created a four hour reconstruction, "OUT 1: Spectre" which focuses more intensively on the intertwining tales of the two featured rival theater companies and central mysterious Cabal. Literally one of the only chances to see it that decade, (on home video, online, in the theater, or otherwise), this shorter reconstructed version screened at Northwest Film Forum as part of their "Lighter Than Air: The Films of Jacques Rivette" retrospective in 2007. The mythic, ultra-obscure, 'unviewable' status of this rare, significant work in the totality of the New Wave, will end for most viewers in January with Kino Lorber's deluxe box set release of "OUT 1: Noli Me Tangere".